A relatively unknown delight, Bottarga was first produced by the Phoenecians and has grown in popularity in Europe in recent years. Unlike anything you will have tasted before, this delicacy is versatile and unique! Want to find out more? Read on! Bottarga is a speciality of southern Italy – particularly Sicily and Sardinia. It is fish roe – usually mullet or tuna (red tuna bottarga is considered more of a delicacy) which has been salted, pressed and air dried. Sometimes known as the “poor man’s caviar”, it was once a humble ingredient, produced and eaten by fishermen when out at sea but, over time, it has become a delicacy appreciated by chefs and connoisseurs around the world. Its culinary properties can be compared to those of dry anchovies, though it is much more expensive. You may have seen it on menus of restaurants in coastal areas of the two islands, usually as an accompaniment to pasta. The roe is washed thoroughly in iced water, patted dry and cured in sea salt for a few weeks, before being washed again, pressed and then hung for several months until dry. The result is a solid block of cured roe. Firm and solid with an amber colour it has an intense savoury, fishy flavour. This preparation of this product dates back to long before the Italians; in fact, it’s been traced all the way back to the Phoenecians. The flavour of bottarga is strong, salty, and fishy and a little goes a long way. It’s best used sparingly, grated over pasta or omelettes. It’s quite intense and gives that kick that only a few very special ingredients can! Bottarga is often called ‘gold of the Mediterranean’ or the ‘truffle of the sea’, both for its price and its super food qualities. 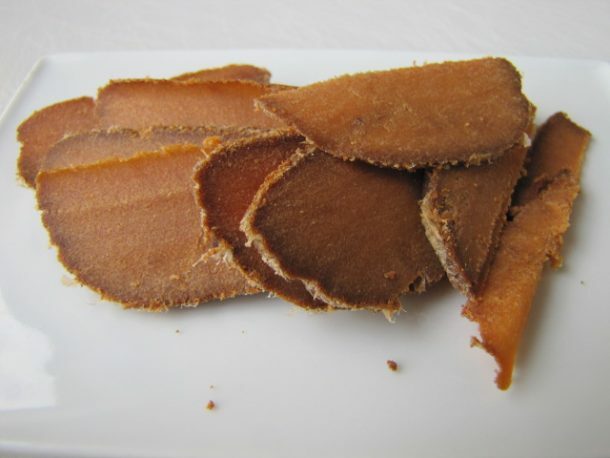 Naturally bottarga has all of the nutrients of fish and packed with zinc, omega-3, vitamins A, D and K, protein and calcium. It has also recently been hailed as a cancer fighter. It can be enjoyed as a starter on bruschetta or just as it is, cut into fine slices or shavings, simply seasoned with a trickle of extra virgin olive oil, lemon or lime. The most traditional way to enjoy its unmistakable flavour is to grate some onto pasta-based first courses, preferably long pasta shapes such as spaghetti or linguine. You can also make it into a velvety sauce by lightly sauteeing the bottarga with olive oil, parsley, chilli and lemon juice. This sauce can be stirred into pasta or can be drizzled over vegetables such as beans, asparagus and broccoli. Bottarga also be crumbled over a bitter green or Caesar salad. It should be kept in a cool place away from the light and ideally in the fridge. Step 1. Pour the olive oil into a large pan and add the finely chopped garlic and brown gently. Step 2. Add the grated bottarga. Step 3. In the meantime cook the spaghetti in a large pan of water (use only a little or no salt for this recipe) until ‘al dente’, drain and add to the oil and bottarga. Step 4. Mix well and grate a little more bottarga on top as well as your lemon zest. Quick tip: Make sure that you mix the spaghetti in well until the bottarga has melted in – if necessary add a little of the pasta water. This pasta dish is easy to prepare and really tasty. There are just 4 main ingredients: Spaghetti, anchovies, bottarga and cherry tomatoes with some bread crumbs added in for extra texture. Step 1. Cook the spaghetti in a large pan of boiling water (use only a little or no salt for this recipe). Step 2. Simmer the chopped garlic in the olive oil, after a few minutes take it out and add anchovies and chopped tomatoes. Step 3. Cook for another 3 or 4 minutes, add the bottarga and after a minute turn off the heat. Step 4. Drain the pasta retaining a little of the pasta water. Step 4. Add the pasta to the pan with the sauce you have prepared, add 2 spoonfuls of pasta water, gently mix the ingredients together, add the bread crumbs and serve. Step 2. In the meantime, gently brown the crushed/chopped garlic in the olive oil in a frying pan. Add the sliced sun dried tomatoes and the colatura. Cook for a couple of minutes and turn off the heat. Step 3. Add the finely chopped parsley. Step 4. Add the cooked and drained pasta to the frying pan with a little of the cooking water if necessary. Mix well on a low heat for a couple of minutes, add some chilli. Step 5. Serve with the grated bottarga sprinked on top and enjoy this flavour explosion! 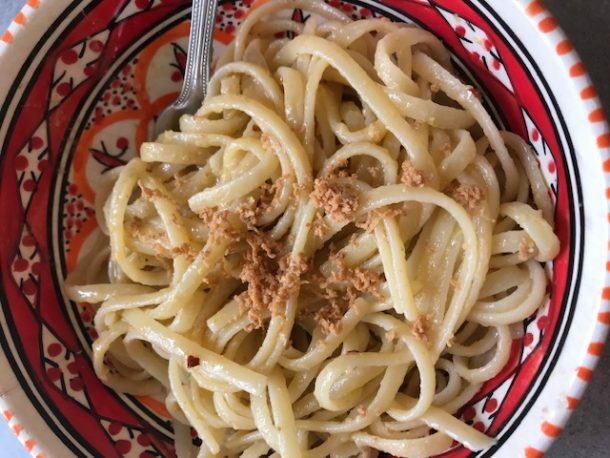 If you’ve tried Bottarga before, let us know where and when! And if you already cook with it at home tell us your favourite recipe!